Are polka dots your thing? 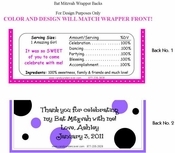 Then you will love this candy bar wrapper with our colorful dot design. Our HOT DOTS CANDY WRAPPER is so chic and perfect for the occasion.